Nowadays medical diagnosis, treatment and prevention of diseases require contemporary, precise and reliable medical instruments. 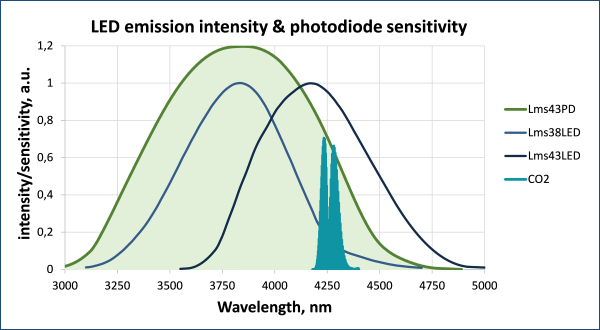 We offer new optical sensing tools based on mid-infrared LED-PD optopairs that can be used in a vast number of medical applications. Creation of a compact scanner based on multi-element mid IR LED-array will enable scanning of a certain spectral range within several seconds, defining absorption properties of the analysed matter and detecting the existence of some deviations from the normal levels. 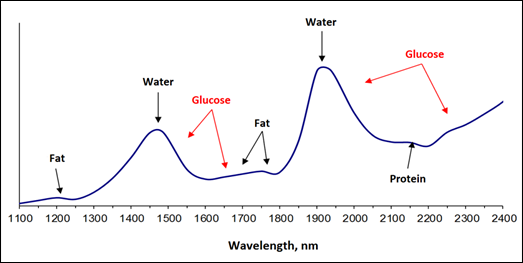 Measuring of glucose absorption based on control of one or two peak wavelengths may not provide reliable results due to the influence of fat, hemoglobin, water and other substances on the measuring signal. Only complex analysis of the absorption spectrum can provide good selectivity and reliability of glucose measurements. ▪	COMING SOON CDS-5 system for CO2 detection with a compact optical cell that incorporates an LED and a photodiode with a special glass covering. It includes all the needed circuitry for quick setup: LED driver, photodiode preamplifier, synchronous detector. ▪	COMING SOON СDS-4 CO2 sensor module – a low-cost “on-board” system with very low power consumption that includes a compact optical cell and electronics for LED power supply and PD signal amplification all-in-one. ▪	NEW LA-T LED Analyser a device oriented for the initial experiments with different liquid (and other) substances, enables defining the absorption properties of the analyzed sample in the spectral range 1.3 – 2.3 µm.